According to yesterday’s Marin Independent Journal, what looks like SF cable car No. 773 has been sitting along Redwood Highway in Mill Valley for some time. However, it’s no cable car — it’s a coffee kiosk that was custom built in Oregon to look like one, and it is destined to become the Mill Valley location of yet another Cable Car Coffee Co. drive-through coffee shop: Marin Independent Journal – Leslie Harlib’s Cuisine Scene: Cable car’s next stop – coffee. This Mill Valley location has been in planning for seven years. 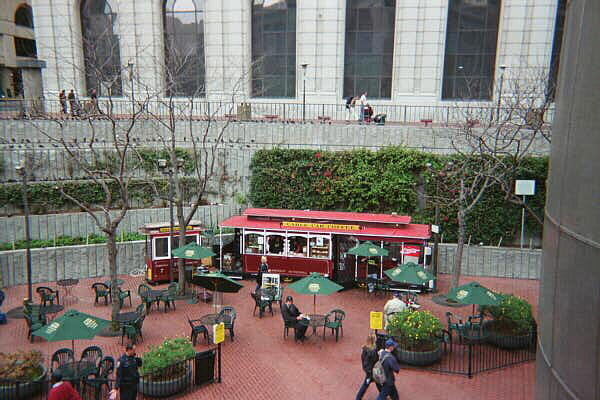 The owners also own the cable car-shaped coffee kiosk at Hallidie Plaza (at Powell and Market Sts., pictured below), another kiosk in Vacaville, and locations in Yokohama, Japan and Hong Kong. Not surprisingly, they may as well sell hot water, given the coffee quality. But with their locations and tourist-ready branding, they apparently do a good business. Greg, I am an architect who happens to be looking for such cable car models for a restaurant client who wants to establish a San Francisco theme – and your article mentioned that these were custom built in Oregon. Do you happen to have any additional info on the “cable car” itself? How did you learn they were made in Oregon?